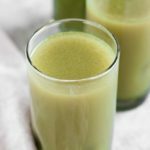 Many green juices are off the table once you go keto. They’re higher in sugar and don’t have any fiber to help balance your blood sugar. But not this green lemonade. Next time you need a refreshing pick-me-up, ditch the Whole Foods juice cleanse and grab one of these sugar-free keto green juices, aka green lemonade. This recipe is a great alternative to the sugar-laden lemonade and other juices you’re probably used to, but with all the flavor and nutrients. With a nice dose of your daily greens, this low-calorie, gluten-free, keto, and Paleo-friendly green lemonade is a perfect pairing for lunch, dinner, or post workout. If you’re like most people, getting your daily dose of leafy greens is tough. There are only so many whole food sources like baby spinach and kale leaves you can eat! Move over green smoothie, you’ve got competition now. Keto Greens Powder comes packed with nutrition from several different herbs veggies, but it also contains an extra boost that you won’t see in most greens products — MCT powder. MCTs, or medium chain triglycerides, are great for brain health. These fatty acids can easily cross something called the blood brain barrier (BBB), which filters out compounds that don’t belong in this very important organ. Once across the BBB, your brain can use these MCTs as a quick source of fuel[*]. MCTs work differently in your body than long-chain fatty acids. They’re absorbed by the gut much faster and then sent directly to the liver to be used as fuel. Due to this rapid absorption, they often generate ketone bodies, which are the preferred source of fuel for your brain[*]. Ketones have many neuroprotective functions. They can decrease inflammation in your brain, and also enhance the function of your cell’s energy warehouse, known as your mitochondria[*]. Lemons may also boost brain function. In one animal study, mice fed lemon juice showed an increase in short term memory. It’s believed that flavonoids are responsible for this memory boost, but more research needs to be done[*]. Keto Greens is full of mineral-rich plants that can help you fight off the symptoms of transitioning into keto (aka keto flu). When your body starts using ketones as its primary source of fuel, a shift occurs. You temporarily start losing more electrolytes like sodium and potassium, along with some water. The reason for this shift is something called “the natriuresis of fasting.” When you begin to produce ketones, your body doesn’t know what to do with this new abundance of fuel. For the first few weeks you end up excreting some of those ketones as your body gets used to using ketones as your main source of fuel. The only problem is, when you excrete ketones, you lose sodium along with them. And when your excrete sodium, it takes an opposite charged electrolyte with it as well — usually potassium[*]. That means, you end up losing a bunch of sodium and potassium as you’re transitioning to ketosis which can lead to symptoms like brain fog, headaches, fatigue, and assaults to your digestive system like nausea and indigestion. Luckily you have a delicious antidote to the keto flu and its unpleasant symptoms. The Himalayan salt in this recipe will certainly boost your sodium intake. And as for potassium, Keto Greens powder is full of great sources of this important electrolyte to help you balance any loss that may occur[*],[*]. A delicious lemonade that can also help you shed excess pounds? Some dreams do come true. This bright and refreshing lemonade will not only energize you with its sweet lemon scent, but it may even help you burn off some extra fat. Lemons are well known for being high in vitamin C, but they’re also a great source of polyphenols — a group of naturally-occurring phytochemicals in many fruits and vegetables. Naringin and naringenin are two polyphenols that are often found in citrus fruits, including lemons. They boast strong anti-inflammatory and antioxidant properties (great for your immune system), and help battle obesity in animal models[*]. In one study, lemon polyphenols were shown to increase fat breakdown and suppress weight gain in mice that were fed a lemon extract[*]. If you’ve ever tried to lose weight, then you know how tough it can be to stave off cravings. Eating foods that can help curb your appetite while also helping you burn calories is essential if you really want to make progress. Luckily, MCTs can do both. Studies have shown that MCTs can not only help you shed extra weight, but they also help decrease your appetite[*]. In addition, MCTs burn more calories than long-chain fatty acids as they’re being absorbed and assimilated into your body. So opt for that coconut oil (rich in MCTs) or MCT oil or powder when you have the chance[*]. Working to avoid the dreaded “keto flu?” Blend up a pitcher of this low-calorie Green Lemonade to replenish your electrolytes and quench your thirst on hot summer days. It’s also a great choice on days when you can’t fit in all your fresh veggies. It’s like a multivitamin but made from real, whole foods. And replace your favorite juice cleanse with glasses of ice-cold keto greens — low in sugar and high in an array of nutrients your body craves. This is an especially handy recipe if you’re not a smoothie fan. It tastes just like green juice, but without the sugar. Next time you feel like you haven’t gotten enough of your daily greens, whip up this easy recipe and discover how delicious green juice can be. Add water, Perfect Keto Greens Powder, lemon juice, and salt to your high-speed blender. Blend on high for 10 seconds. Taste and add liquid stevia based on your sweetness preferences. Serve this blended green lemonade chilled.